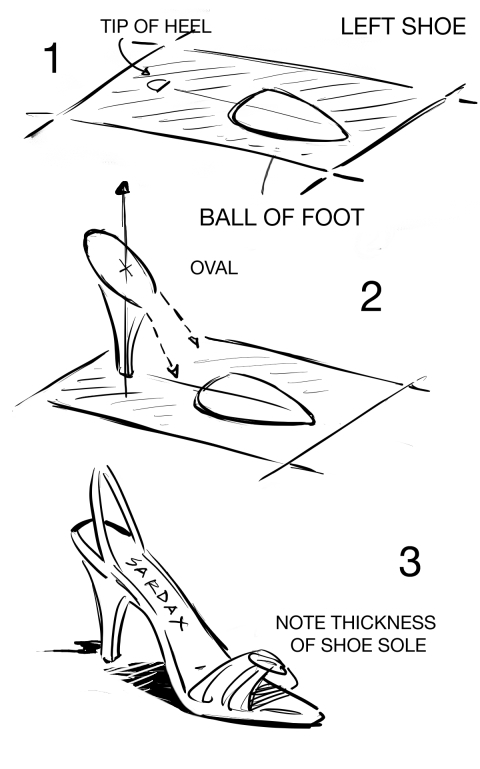 So someone asked me to show how you draw a high-heel shoe. High-heels are not easy to draw. I've seen the most adept artist stumble over them. The problem is the subtlety of the curves and an understanding is needed of the shape of the foot which they cover. Let's start with a simple sandal. Find or buy - or beg for -a shoe and examine it. A high-heel, like any shoe, is a platform for resting on a level surface.The foot rests at two points - the ball of the foot and the tip of the heel. The front area itself will be a roughly pointed oval shape, flattened behind following the shape of the foot . It is not symmetrical - rather flattened on the inner side following the shape of the foot. 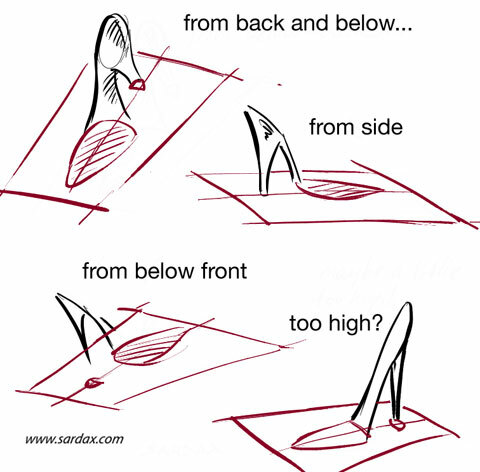 2)Then you can decide on how high the heel is to be and draw a line roughly perpendicular from the heeltip, and begin to work out the shape of the heel itself. it tapers gracefully downwards at the back. Then you can start roughly sketching the area where the heel of the leg itself will rest - for now you can make this an oval. On higher-heeled shoes this will need to be steeper sloping. Observe the countless ways straps are employed - some very simple, others extraordinarily complex.